Does EXO’s Leader Suho Have a Girlfriend? Learn More About His Ideal Type of Woman and Dating Rumors! Are You Curious About EXO Member Suho’s Love Life? As the leader of the popular boy group EXO, all the life aspects of Suho have been drawing the public’s attention, including his love life. In one interview with the media outlet, Suho stated that the girl whom he is looking to be his girlfriend is a girl with literary interests. Moreover, Suho’s ideal type must have long straight hair. 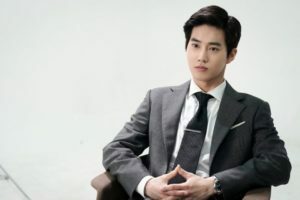 Though never really involved in a dating scandal, many fans have paired Suho with several female idols, which we will introduce in this article. So, keep reading! The first female idol who has been paired up with Suho is the leader of Apink, Park Chorong. Many fans think that Suho and Chorong are suitable to be a couple because they have lots of similarities, such as being born in the same year, namely 1991, have a petite figure in their respective groups, and have an innocent and pure image. Not only sharing similarities, but Suho and Chorong have also interacted with each other on several occasions. According to fans’ assumption, who watched the fan cams of MBC Gayo Daejun in 2012, the leaders were seen talking and laughing together at the backstage of the show. At that time, Suho waited for Chorong who was the last person to get off the stage. Not only on the year-end music show, but Suho and Chorong were also standing near each other on MBC Idol Star Athletic Championship (ISAC). Despite not talking to each other, their fans already felt content seeing the pair share a close space. On another occasion is when Suho was interviewing Apink on SBS Inkigayo. At that time, Apink was promoting their song “LUV”. 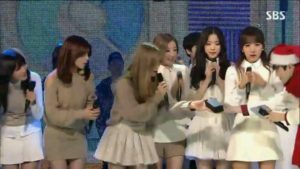 Still, on Inkigayo, Suho and Chorong interacted when Apink won awards. 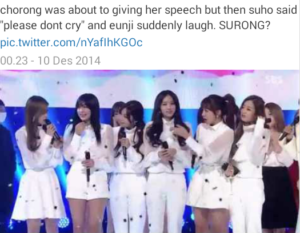 Suho soothed Apink members to not cry before Chorong started her winning speech, whereas on the other occurrence Suho gave the trophy to Chorong on his last day as the host of the show. The last public interaction between Suho and Chorong was in Vietnam, where Apink and EXO had a joint concert with other groups. A press conference was held before the concert started. Notably, Chorong and Suho attended the press conference as well. 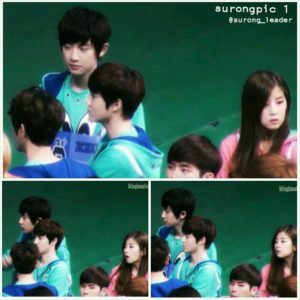 At one moment, Chorong gazed tenderly at Suho who was talking. The adorable interaction made their fans giddy, wishing that the two leaders will somehow end up together in reality. The second female idol who has been paired up with Suho is the main vocalist of Apink, Jung Eunji. Unlike his so-called-interaction with Chorong, Suho interacted publicly with Eunji as they met several times on variety shows. Their first encounter occurred when both of them were guests on the MBC virtual marriage show We Got Married. At that time, Suho and Eunji went as the friends of Apink’s Naeun and SHINee’s Taemin who were a couple in the show. Many fans also suspected that Suho and Eunji had interaction through a brief of glance in SBS Inkigayo when Suho hosted the show. They met when Apink had their comeback promotion. Reportedly, Suho and Eunji worked together as the dubbers for the animation movie Saving Santa in 2013. They attended the press conference of the movie along with other dubbers of the film. 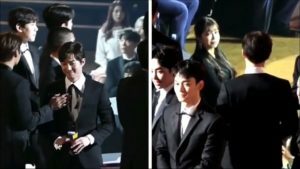 Suho and Eunji’s friendship remained strong throughout the years as they interacted on Asia Artist Award in 2017 as you can see below. The most recent female idol who has been linked with EXO’s Suho is his fellow agency artist Red Velvet’s Irene. Similar to Chorong, Irene also has many similarities with Suho, such as being the leader of the group, being born in the same year, has similar visuals as both of them have milky white skin and small faces, and work under SM Entertainment. 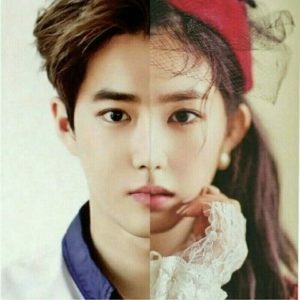 Their similarities are depicted in a fan-made picture where on the left side is Suho’s face and Irene’s face is on the other side. 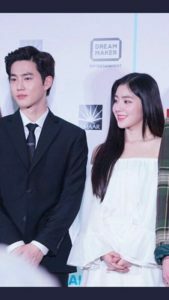 Suho and Irene were also seen several times standing near each other at public events. Their pure and flawless beauty was admired by the fans and the general public alike, saying how they look like aristocrats and have a respectable charm that no one can imitate. 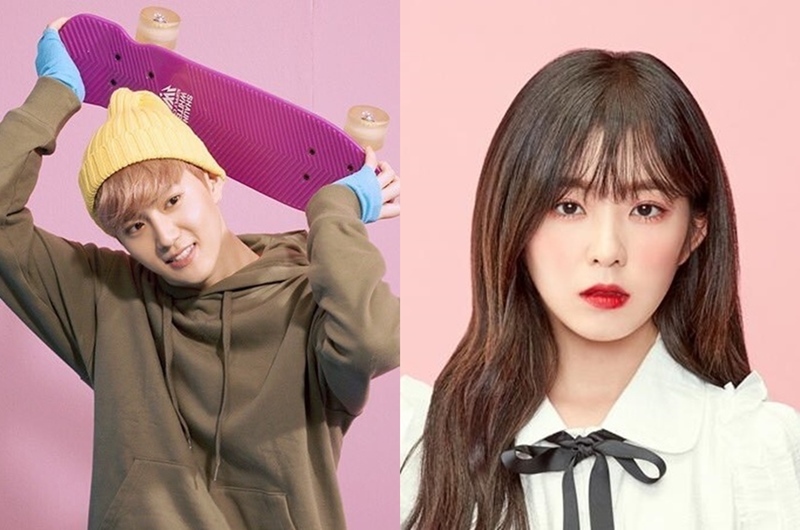 In April 2018, a fan account reported that Suho and Irene were seen interacting during the press conference of SM Town Dubai. The leaders directly headed to their chairs in the back row but Irene did not instantly sit. It turned out that there was no cloth on Irene’s chair (which is usually used to cover the thighs). Suho who was seated beside Irene called the staff to ask for the cloth. 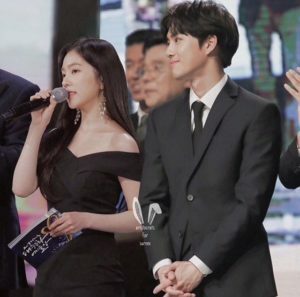 Suho and Irene’s interaction at the press conference did not stop there as Irene was seen looking at Suho when she had difficulty in pronouncing something in Arabic. Suho was seen correcting Irene’s pronunciation while smiling at her. Many fans think that Suho and Irene must be close enough as agency colleagues since they look comfortable with each other. Here Is Actress Park Ye-jin Life Stories From Her Wedding to Her Movies!